An Alsager couple who have fostered more than 20 children have been recognised with a long-service award from Cheshire East Council. 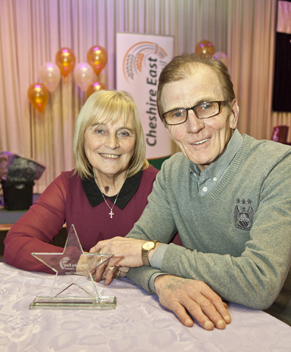 Ann and Arthur Frost were among those recognised at a ceremony in Congleton where 25 awards were presented to foster carers across the Borough in recognition of the way they improve the lives of young people. Ann and Arthur, who live in Alsager, are currently fostering twin boys with Down’s syndrome who have been with them for about 12 years.